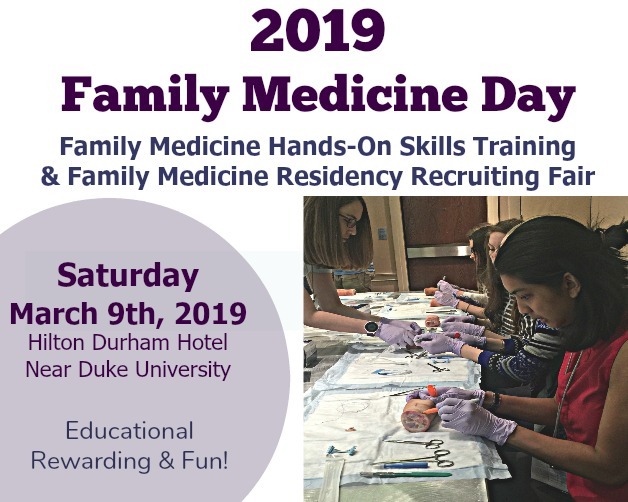 Saturday, March 9th, 2019 ~ 12th Annual Family Medicine Day! The North Carolina Academy of Family Physicians and the North Carolina Area Health Education Centers (NC-AHEC) program are excited to partner once again to present North Carolina’s 12th Annual Family Medicine Day. This fantastic one-day event is North Carolina’s premier family medicine residency recruitment conference. Centrally located in Durham, NC it’s easily accessible for all medical students. This wonderful professional networking opportunity will introduce currently enrolled medical students to residents, faculty and other students from across the state of North Carolina & neighboring states. You do not want to miss this incredibly fun, educational and hands-on day! Registration is currently open for all exhibitors and for medical students graduating in 2020 or 2021. 2/9/19 – Class of 2022 & beyond medical students may register. 2/25/19 – NOON – Hotel Block closes – no guarantee of free or reduced rate hotel rooms after this time. 3/3/19 – 11:59 PM – Online registration CLOSES. Special Note: This event is a residency program recruitment conference for FM programs to meet and recruit medical students, it is a not a physician recruitment conference. Physician recruiters do not have access to residents or physicians for recruitment purposes. Click here for a recap of 2017 Fam Med Day!